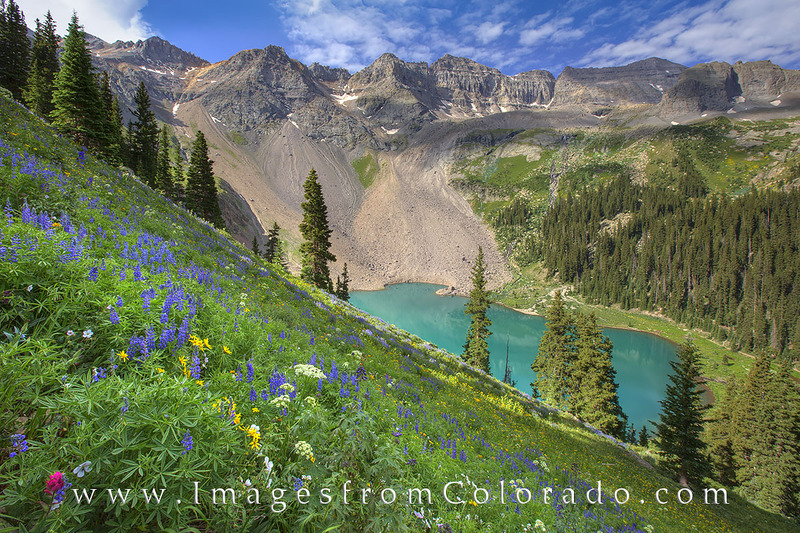 The Blue Lakes hike near Ridgway offers one of Colorado’s best wildflower treks. In July and August, blooms of all colors and sizes can be enjoyed. With a little grunt work, you can hike above Lower Blue Lake, seen here, for stunning views of both a wildflower covered slope and distant peaks of the San Juan Mountains. Going further up on the trail, you’ll reach the alpine Upper Blue Lake. Continue on after that and you have access to Mt. Sneffels, one of Colorado’s 14ers. Photo © copyright by Rob Greebon.